The Franchise REsales Wall is a highly effective and innovative way to market established franchise businesses for sale. With over 50% of franchise business buyers interested in considering a franchise REsale as a preferred option, franchiseREsales.com introduced the innovative Franchise REsales Wall to the MFV franchise Exhibitions. First launched at the Franchise Expo South in Houston, Texas in February 2015, the Wall was a huge success. Located at the entrance to the show the small area attracted almost every incoming attendee to browse the listings as ‘a first point of call’. Even though it was small, its impact as the innovative way to market established franchise REsales was recognized as a most effective and successful way to market Resales and present options to the many attendees looking to start trading straightaway. “The resale wall at the Franchise Expo South was a great addition. There was a constant flow of visitors taking a look at available opportunities. I believe it drove additional traffic to our booth.” – Brian Savage, CFE – Baskin-Robbins, Business Development Manager. “"Thank you for letting us test your franchise RE-sales board at the Houston Franchise Show! It was amazing to see the amount of traffic it generated for our store in College Station Texas. We literally had several buyers backed up to purchase this location that spotted it on your board. Following the trial at Franchise Expo South, The Franchise REsales Wall was significantly expanded at the International Franchise Expo in New York (IFE). 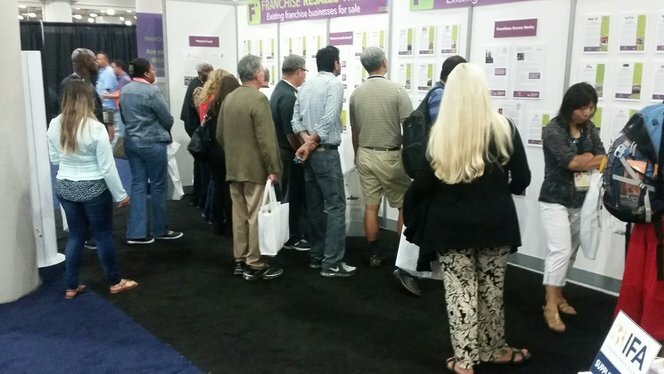 At the IFE the Franchise REsales Wall was tripled in size to hold 58 listings of established businesses for sale in addition to financial and legal advice for buyers and sellers. The Franchise REsales Wall will now be a permanent fixture at franchise exhibitions held nationally, helping to provide a service not available before to both franchise business owners and new buyers. Many exhibitors and business sellers reported inquiries from serious and qualified buyers resulting from the franchise REsales Wall. 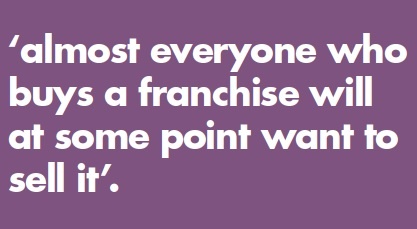 “I can’t say enough about the Franchise REsales team. They helped me create an ad, which was then placed for me on the ‘Franchise REsales Wall’ at the Franchise Expo in NYC. Within a couple of days I was fielding inquiries from quality prospects. This listing had generated no interest prior to my placing the ad with franchiseREsales. Now I expect to be selling it soon.” – Kevin Doyle, CPA & Business Broker, Transworld Business Advisors.